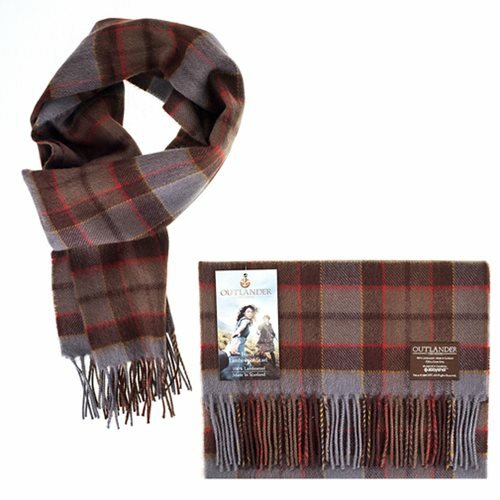 The official Outlander Fraser Lambswool Scarf will bring out your inner Scotsman! More than a scarf, it's a raised glass to Scottish culture. The cloudlike softness serves to protect your neck from the harshest winds of the Scottish Highlands, but you may have to carry a kebbie (walking stick) around to keep people's hands off of this masterfully woven 100% pure lambswool scarf that measures 66 1/2-inches long x 12-inches wide, not including the fringe. The only thing better than putting on this beautiful scarf inspired by the Outlander TV show is having your beautiful other do it for you. Then again, the thought of keeping it for themselves might pass through their minds, so you may want to reconsider. Ages 13 and up.